a decade before anyone had ever heard of Resident Evil or Lara Croft! Read these groundbreaking tales NOW on ComiXology, starting with the debut story arc from Dark Horse Presents #35-37. 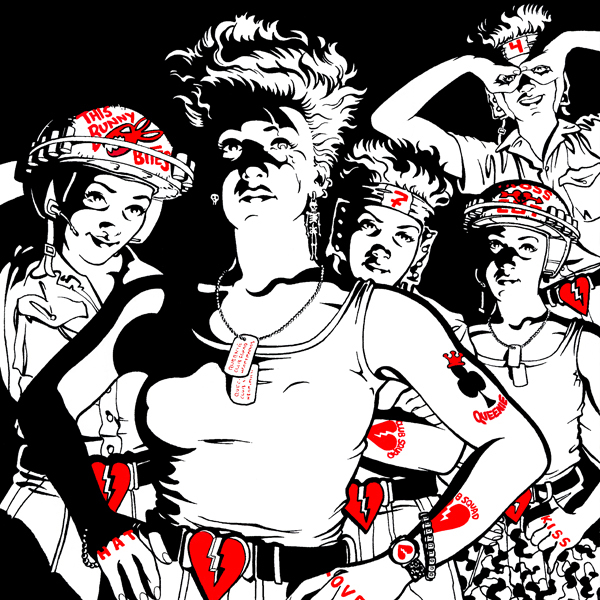 For the first time ever, the entire Heartbreakers run will be reissued in digital form, thanks to MonkeyBrain Comics! New reviews are lauding Heartbreakers as "a joy to read," with artwork "reminiscent of classic... Dave Gibbons." The series "feels refreshing and new, despite being 20+ years old, and is a must for anyone looking for some smart, dystopian sci-fi." 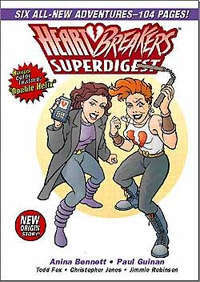 Heartbreakers is a series of science fiction comic books and graphic novels by artist Paul Guinan and his wife, writer Anina Bennett. They've been creating Heartbreakers stories together since 1989. Queenie and Delta share their creator’s genes as well as her memories. But each of these clones has her own personality and purpose: Delta’s a scientist, Queenie’s a soldier. In their world, genetic engineering is an everyday event, clones are second-class citizens, and big business runs the show. But that doesn’t stop this feisty, brains-and-brawn duo from tackling problems both big and small. Averting a global food crisis, fending off desert pirates, reconstucting ancient robotsit’s all in a day’s work for the Heartbreakers! They're available at comic book shops (call 888-COMICBOOK for a list of stores near you), as well as directly from us. 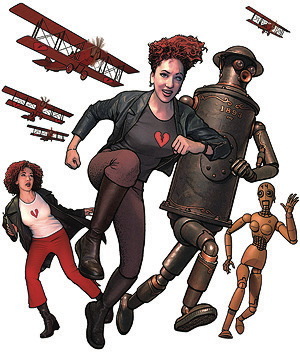 The latest graphic novel in the series, Heartbreakers Meet Boilerplate, is a self-contained story by Anina and Paul, featuring BOILERPLATE in a prominent role. Paul created the art using his exciting new digital techniques, and Anina modeled for all the clones! Comics giant Alex Ross declared the book "STUNNING! A brilliant innovation in graphic storytelling." Even Harlan Ellison liked it. 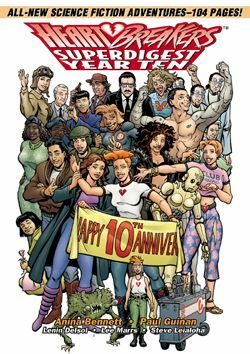 Nominated for a 2006 EISNER AWARD!